Texas BBQ Civil Rights Heritage Tour Day 8: Austin, Texas to Lafayette, La. As of tomorrow, I can scratch the Texas BBQ portion of this road trip. I have arrived in the Land of Boudin. Louisiana boudin, however, differs profoundly from French boudin. Both may be peasant/poor people’s food, but, unlike the French kind, there is no blood in Lousiana boudin. More’s the pity. As far as I can tell it’s all rice, mystery meat, and sausage casing. But I’m getting ahead of myself. It took me 5 trips to pack my car this morning. The amount of jarred Hatch chile salsa (purchased outside of Las Cruces at a farmer’s market), roasted chiles, and Texas bottled bbq sauce, in addition to my almond milk, cereal, coffee, and peaches, is ridiculous. I can barely see out my back window for all the bags of Mi Nani’s tortilla chips behind me. 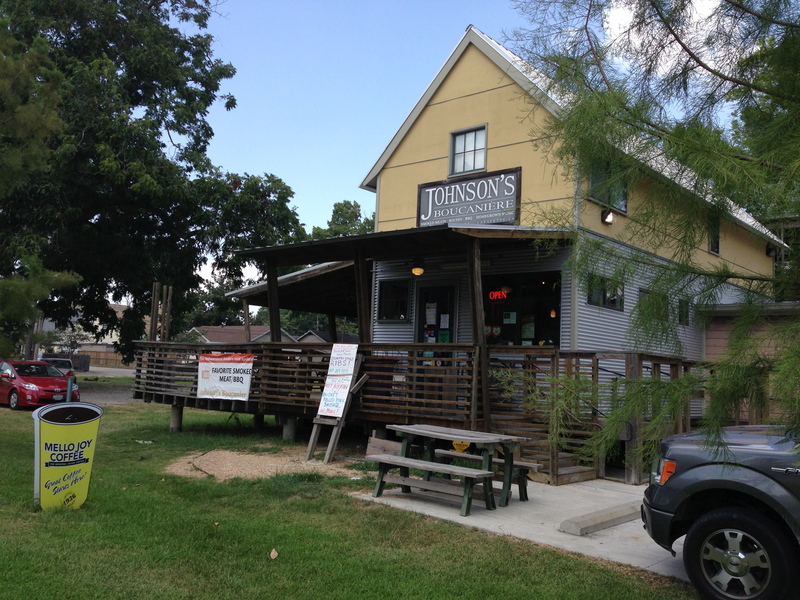 On the way to Interstate 10, I drove through little towns I remembered from my Best of Texas BBQ list, but I couldn’t envision driving half a mile out of my way to investigate brisket at 9:30 am. Then I passed through Luling. 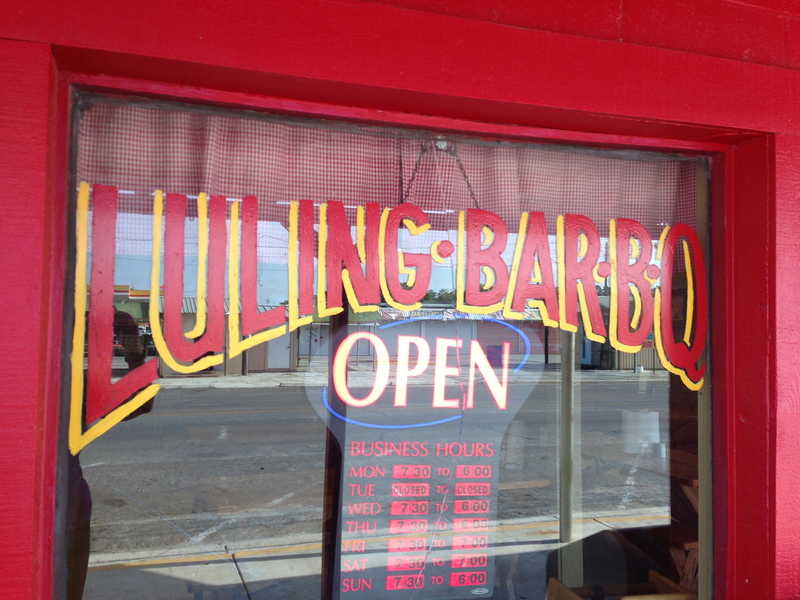 There, right next to the turn off for I10 was Luling BBQ and the sign said “OPEN.” At 9:45! What could I do? I needed a control group for Franklin bbq! I bought a few small slices of brisket — I saw the owner take it off the grill far in the back — and one sausage link, all for less than $9. I ran to the car, open the styrofoam, and sampled. The link had jalapeño in it, which means it was an improvement over Franklin’s. I ate 2 chunks and stopped. The brisket was dry. It had noticeable smoke. The fat was sweet. But the brisket was dry. It was drier than Franklin’s smoked turkey (actually, unfair comparison, because I’ve never tasted such moist smoked turkey as Franklin’s). For the next 6 hours, that dry brisket sat in my gut. Maggie is right: I better push my car to Virginia to work off all this meat. As soon as I crossed into Louisiana, signs for boudin, crackling, and bbq lined the interstate. I saw more visible signs of bbq along I10 in Louisiana than I did in Texas. Tacos were far more prevalent in Austin, but that might be a reflection of the city’s demographics. Even after several hours of no food, the most I was in the mood for local culture was Howlin Wolf and Lucinda Williams. But I’m a trouper. I set my navigation for Johnson’s Boucainière, about 2 miles off the interstate. Not a great picture, but an old man glared at my from the window and so I felt self-conscious. I went through the same routine: please, pretty please, just a little sampling of a rib, a slice of brisket, pulled pork, and a boudin. They were very nice and obliging. And it was cheap, about $15 for meat, slaw and corn. Within half an hour, I was checked into a room at the Fairfield Inn, seconds from my road tomorrow. I scored: they upgraded me to a suite. Once settled, I opened my second styrofoam container of the day. The boneless rib was by far the best of the sample. As for the boudin, I don’t get it. Neither does the native Creole lady at check-in. “I’m not a rice person myself,” she said. The rice wasn’t my problem. Sally, you are a hoot! I can just see your little car packed to the gills with stuff hanging out of the windows. Hint! an Alka Seltzer can settle the stomach and allow for more bites of differing flavors to be thrown in. Just a thought. Or, allow one to sleep peacefully if one has over-tasted. Reblogged this on Lime & Barley.